why should i book a hair trial? Trials relieve stress + fear of the unknown! It is a great way to "preview" what you will look like on the day of your wedding + to see whether my updo style is the right fit for you. I suggest booking your trial three months prior to your wedding day. That way if any changes need to be made we will still have plenty of time! 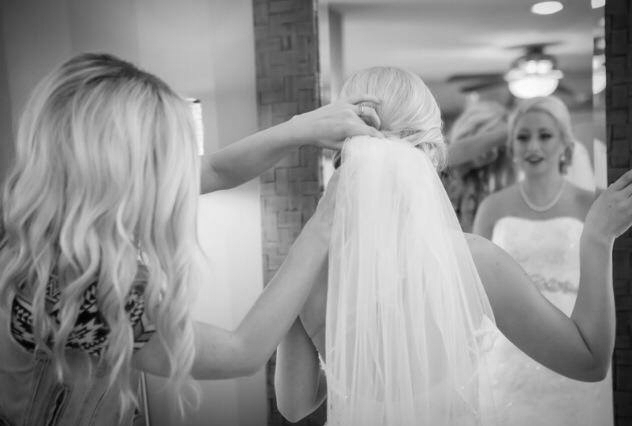 The perfect day for your hair trial would be the day of your bridal shower or your bachelorette party! how would you describe your updo style? I would describe my updo style as natural, romantic, lived-in, boho chic, and loose + flowy! I also love doing "classic" updos with my own take on them. do you have a preferred make-up artist you work with? My favorite make-up artists to work with are listed below! Make-up + Photo: Hannah Elisabeth Beauty | Bride-to-be: Amanda D.
Photo: Colin Lyons Photography | Bride: Lisa R.
how many can you service on my wedding day? Depending on your timeline, I can service up to 8 on your wedding day. If I bring one of my preferred second stylists, we can service many more! how long will an updo/style take? It typically will take up to an hour for each updo + up to 30-45 minutes for styled half up or down. Closer to your wedding day, I will create a hair timeline for the bride + bridal party. You can also create your own if you would rather!